In ISO 9001 the concept of keeping training records seems one of the simplest required, but more often than not I find it is the one area of the system that companies get, well, the wrong way round. It is very common to find that the training records are there for each member of staff and within them I will find certificates from training sessions and other relevant qualifications for what the current job holder has achieved. Unfortunately, this doesn’t demonstrate competence for the job in hand as required by the standard merely what training and experience relates to the current job holder. What you need to do first off is actually forget the person and focus on the job. Take each position and list what skills your business requires from a potential job holder in order for the resultant output of work to be effective, as if you were recruiting from scratch. Most companies collate this information into a training skills matrix with the skill often down the left with the job title entered across the top. Now you can add back each member of staff working for you under the appropriate job title and then what type of the records you have on their file as validation. Instead of being swayed by what they have got already of file you assess them against the requirements of the job. Where there are gaps then you have neatly brought to the fore your training needs and requirements. From there you can integrate those into an annual training programme and budget. Some companies go to another level by highlighting the actual experience each employee holds for a task. for example, you might have a numeric, alpha or colour coded key to illustrate ‘Learning’, ‘Needs Supervision’, ‘Can work unsupervised’, ‘Can train others’ etc. Sounds simple but you would be amazed how many companies shortcut the process. Further information on maintaining your ISO 9001 system can be found at the ISO 9001 Support Centre as part of the service provided by The BPAS Group. 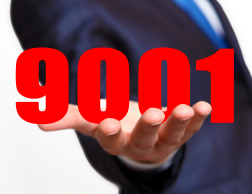 So you need to do some internal audits for 9001 – but can you just be ‘competent’ as it states in the standard or is it worth going the whole hog and becoming ‘qualified’? Certainly those of you who want to make a career of auditing are advised to take those few days away from the office on a UKAS approved course complete with an examination at the end. However, what about those of us who will only ever conduct internal audits on our own system on our own site? Rather than the sterile classroom session wouldn’t it be better to get someone in to run bespoke sessions using your own system? That way you could use your own processes to help demonstrate the principles and, more importantly, ask questions to gain understanding as regards your own issues on site – get answers to to your specific questions so you can implement what you learn straight away. Sound good to you? The formalities of this training can still be covered – session notes, multi-choice examination (even an open book one) plus a certificate of attendance for your training file. The question then is where do you look for such a session? followed by how to raise and handle Corrective Action Reports through to a satisfactory conclusion. All this closely linked to your system using your processes and terminology. You can even help set the agenda as I want the content to really be relevant to your situation. You will also receive copies of my report to take away “The five most common mistakes when doing internal audits”. Finally, those last two sessions on site can be taken as a full day if you prefer and should distance be an issue then we can do them virtually over the web so you don’t need to miss out. So, being competent will suffice if you know where to look – and now I guess you do – click here.